These pictures were taken in August of 1994, when my mother, older brother and I took a short trip to the Czech Republic in search of my mother’s “long lost relatives.” The impetus for the trip occurred when my grandfather had died the year before, and my mother had sat by his bedside dumbfounded as he mumbled and sang in Czech- a language she had never heard him speak before these final moments at the very end of his life. My grandfather never revealed much of his childhood to my mother, nor did he ever pass on any sort of Czechoslovakian traditions or sense of identity to his children. Hearing him speak this foreign language therefore moved and surprised my mother profoundly, and stirred within her a deep curiosity to find out more about this side of her family, and herself. She knew she still had relatives in the old country, since she remembered her aunt Barbara used to send a little money to some of them before she died, but aside from this she knew nothing. 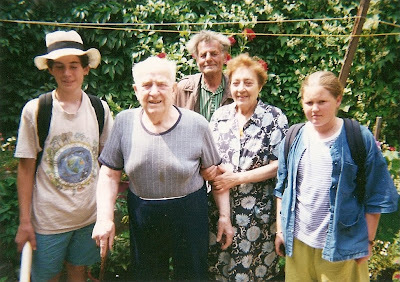 About a year after my grandfather’s death my family went to Italy for the summer. Since the Czech Republic is not too far from Italy, my mother thought a side trip was in order. My father had to take a business trip in the middle of the vacation, and after he left my mother loaded all four of us children onto a train in Arezzo and we traveled north to San Danielle del Friuli, where some close family friends live. We dropped off Thea and Simon with them, and then my mother, Sven, and I boarded a train that crossed through Austria overnight, and in the morning arrived in Tabor, Czech Republic. From here Sobeslav, the small town where our “relatives” lived, was only another short train ride away. The events that unfolded that day traumatized me as an eleven year old, and are documented in the following essay I wrote in seventh grade and decided to dig up and share after I also found these snapshots. While comparing the train station in Tabor to a train station in WWII was certainly a bit melodramatic on my part, my mother can attest that the vibe when we got off the train was not good. I didn’t know it then, but we had arrived in the Czech Republic only five years after the Velvet Revolution, and only a year and a half after Vaclav Havel had taken office. The country was therefore still emerging from behind the curtain, and while I may have been a bit overly dramatic in my impressions as an eleven-year-old, I certainly was picking up on some of the residual social and political tension that had not yet completely dissipated. I think this feeling was also due in part to the fact that while I had traveled to other countries before this, it had always been to affluent European countries like Finland where we rode bicycles and watched strange Scandinavian cartoons, or Italy, where we were smothered in kisses and overfed by loving Italian friends and neighbors. This was an entirely different and foreign part of Europe that I had never seen before. And that morning we had arrived after spending weeks in Italy- extroverted, loud, loving, wild Italy. The contrast for me was overwhelming and I found it extremely freighting. I can’t help asking myself now how this experience would have been different if I went as an adult. Surely it would have been disturbing, but I don’t think it would have been quite as visceral as it was for me as a pre-adolescent. As soon as we got there all I wanted to do was go back, as evidenced by my mother’s snapshots in which I look less than thrilled. I spent nearly the entire day in tears, begging my mother for us to leave. The first picture is of me in front of a bridge, right after we left Antonia’s house. I think my mother wanted me to stand still so she could snap the picture, and from the looks of it I was flatly refusing. The second is of my brother and Antonia in her house, and the last is of my brother and me at the “translator’s” house with Jan standing in the back in the green shirt. Below is the essay I wrote in Mrs. Meyer’s class in all its resplendent seventh grade glory. I think I wrote it only a month or so after it happened, and the prompt she gave us was something like “write about something you did this summer. Some of the sentences make me cringe now, but I held my itchy fingers back from making any revisions! Brevity is not something I am good at, and this essay (or introduction to this essay for that matter!) is no exception. Sit back and get comfy, maybe go to the bathroom first or grab a glass of water. Or take a break and come back and read it later. As soon as the train pulled into the station, my mother, my older brother Sven, and I walked across the tracks, bags in hand, and made our way to the main building. I felt like I had stepped back in time, like into World War II during the German occupation. It was grey and depressing. People eyed us suspiciously. We quickly made our way up to the main desk. No one looked happy; no smiles, no laughter. You immediately sense these people had gone through something unfamiliar to what I knew. I felt scared and nervous, probably the way they felt about us, strangers in their home. Their home, we were in the Czech Republic. 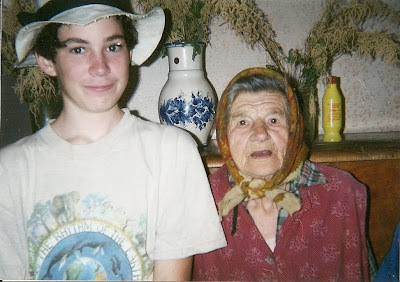 It was the summer of ’94 and my mother, my brother and I had come to seek long lost relatives in a little town called Sobeslav; that is, if there was anyone left. “Three to Sobeslav,” my mother said, using gestures to try to communicate with the woman behind the desk. She understood and gave us the three tickets and said something in Czech. We were puzzled. She said it again, getting impatient. Still we didn’t understand. Then she took a piece of scrap paper and wrote “8 K” which was Czech money. Of course, she wanted Czech money. Well we had just come off a train from Italy, it was seven in the morning, and we didn’t have any Czech money because we hadn’t had a chance to go to the bank. So, my mother shook her head and began to get nervous and very self conscious. The people behind us were getting impatient also. Then, a Czech soldier standing further along in the line pushed his way through and bought himself a ticket, paid for it, and paid for ours as well. He spoke to us in English. Finally! Someone spoke English. My mother repaid him with an American ten dollar bill. He thanked us, told us what track the train would come on, and then left. Immediately after, my brother burst out laughing. “Do you realize what you just did,” he said. “What,” my mother said again. A few minutes later the train pulled into the station and we all go on again. We walked down the empty corridor and found an empty place for the three of us to sit. I was relieved to be back on the train again, and felt less vulnerable. I looked out the window as the train began to move. For the first time that day I saw the beauty of the country. The sun was coming out and I gazed at the rolling green fields, passing forests and small summer cottages by the side of the tracks. It really was how my mother described it. Fairy tale country, magical and mysterious and very beautiful. I was happy to be out of the grey and dismal station that we had arrived at earlier that day and took a few minutes out of reality to let my mind wander. I was snapped back into reality when my mother pulled out a letter she had written about two weeks before. It had taken her about ten days to write because she had to write it all in Czech which meant she had to look up every word in her little English/Czech dictionary. The purpose of the letter was to send it to some names of some people who were supposedly our lost relatives. She had made two copies of the letter. One she sent to the address she had gotten from a cousin at home. The other she kept; this was the letter she pulled out. The letter said that she and her two children would be coming to Sobeslav on the 9th or 10th of August. It told who we were and our business. She hoped this letter had been received so they would know we were coming and who we were. She opened the letter, briefly looked it over, and then went into the corridor where a short, middle aged woman with brown graying hair and glasses was standing. In English my mother said, “excuse me,” and handed her the letter. The woman read it and when she was done handed it back to us and smiled. The train stopped when we arrived in Sobeslav and the woman motioned us to come with her. 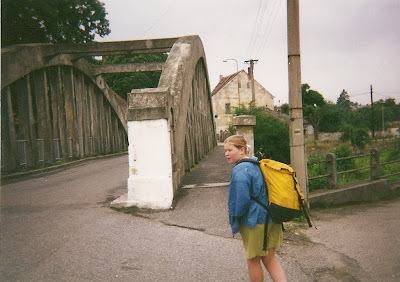 We took our bags and followed her off the train and through the station into Sobeslav. It looked relaxed and somewhat peaceful. The park was on our right with green trees and benches where old women sat discussing whatever they had heard lately, and to the left there were shops that sold postcards, dolls, puzzles, fruits and vegetables, and an assortment of other little things to buy. The woman thanked him and nodded her head saying, “yes, yes, come, come.” We followed her now not stopping to ask people. We crossed the bridge through the town square and into what seemed to be a normal working class neighborhood. We walked a little ways down then stopped at one of the more tumbled down houses. It was triangle shaped and had dead flowers in the front. The grass was overgrown and badly needed to be cut. There was a rust gate. The woman called out in Czech, “Hello! Anybody home?” A few seconds later a man’s head stuck out the window. He shouted back at us in Czech, “What do you want?” My mother stiffened. The woman replied back to him, “Some people are here to see you.” At least that is what I assume they were saying. “Okay, okay,” he said and shortly after he appeared at the gate. He looked to be about sixty five or more years old, was tall and skinny, and had grey hair going every which way. The woman said a few words more and the old man nodded. She then turned to us and smiled. We turned our attention to the man, who opened the gate and let us in. Then we turned around to thank the woman, but she was gone. I looked around but I couldn’t see her anywhere. “An angel,” my mother whispered. He led us through the gate and into the house. It stunk badly of rotten potatoes. The second I entered the house I wanted to leave. Then we proceeded up three flights of stairs. When we got to the top a very old woman greeted us. She carried a cane and poked everything she went by. She was clearly surprised and confused. She motioned us into what I assume was the living room. It had an old table and a mattress on a bed stand, some old books, and a broken TV. We walked into the kitchen. A few rotten pears lay on the table, a few dirty mugs by the sink. They clearly had no food. IT was frightening to see these people living this way. What did they eat? What did they do all day? The way we finally found out they were our relatives was this. In their living room was an old book shelf. On the book shelf stood two old photographs from the 50’s or 60’s of my great aunt Barbara’s family. They lived in Detroit and my great aunt was sending them money and food while she was still living. And this was who my mother recognized in the picture, on top of the bookshelf. I started to fuss. My mother gave me a look saying, look Sophie, we’ve come all this way, just get with it. I felt so helpless I started to express my feelings to my brother but he just laughed. What was his problem? I couldn’t believe it, this was a highly dramatic thing for me and he just laughed??!! Antonia returned with my mother and an old, bloody chicken bone stuck in her pocket. By this time my mother really wanted to leave and we proceeded to the stairs but she yelled at us. So we wrote her a note saying in Czech that we had to leave and if we found someone who spoke English we would return. She read it and we left. Air! Ah air! I could finally breathe again. I walked out the gate with my mother and my brother, who was still laughing. The man with the long grey hair I learned was named Jan, and was Antonia’s son. I apologize for not telling you that earlier. Antonia stuck her head out the window and started yelling at us in Czech. We didn’t understand so we walked down the street towards the town square, found some benches, and sat down. “What if they come find us and drag us back to the house with them?”I asked. “I don’t think Antonia can get down those stairs without Jan’s help, and I don’t think he will be able to find us,” my mother replied. We were all a little shocked at what had happened and I think my mother regretted what she had done. We went to an ice cream parlor to life our spirits. My mother and I got a chocolate ice cream cone, and my brother got a big cream filled pastry. I took one big lick. “Yuck!” I said in an astonished voice. “Yum, yum, yum,” my brother said. “This ice cream has sour milk in it,” I said. “I think you are right,” my mother replied. My brother just laughed as he enjoyed his big pastry. My mother and I discreetly threw out our ice cream. Then for about three hours we walked around Sobeslav, trying to get as far away from the house as possible. I froze. Terror ran through my body. I wanted to run. He crossed the street and came directly toward us, took our bags and motioned for us to come with him. I began to go into hysterics. Where was he taking us, what were we going to do? We began to walk with him. My brother laughed and my mother tried to comfort me although she was very nervous herself. We crossed the bridge and we then stopped at a gate with high surrounding walls so you were unable to see the house. My mother shook her head in understanding. She told me he had found someone to translate for us and I began to calm down a bit. Jan rang the door bell and it was several minutes until a woman answered it, and told us to come in. There was a little court yard with flowers in it. Beautiful flowers! We came with her into the house. She was short with brownish red hair, and wore a skirt with an apron tied around her waist. He name was Maria. She led us into the kitchen where a plump, pale man sat somewhere in his late seventies. The kitchen had a cozy, lived in fell about it. They told us to sit and asked if I needed some medicine because I was crying. My mother politely said no thank you. The old man went and got his diploma off the shelf. He had received mostly C’s and had forgotten most of the English he had learned. They gave us coffee and biscuits and we then proceeded to try to communicate. We got somewhere using the English/Czech dictionary, and we found out a little about the family. The old couple was very lively and full of energy and life. They joked around and we all had an enjoyable time. Then Jan took us to a little diner where we ate goulash and drank coke. It was awkward. We tried to tell him we needed to get to the train station and he seemed to understand but not very well. After we ate lunch we all went to the train station still accompanied by Jan. We got there, got our tickets and realized we still had an hour to spare. So we sat on a bench and listened to Jan talk. When it was time to get the train we all walked up to the train station. The train came and we said good-bye to Jan. He shook our hands. Mine was the last he shook; he wouldn’t let go. I started walking with him still holding onto my hand. I smiled. He smiled. Then we got back on the train and left Sobeslav for good. It had been a long, long day. I had so many thoughts running through my head. Should we have done this? If we should have done it, we certainly should have done it differently. My mother says we were like a naughty child who did something he wasn’t supposed to do. The live so differently to us and experienced things I have never experienced. Now, I can never look at things the same way I used to. That one day had changed my entire life. OMG!!! How is that for brevity. I love reading the in-depth version of these stories I have heard about so many times, but always in bits and pieces. This is very very good. Very good for a 7th grader. I'm impressed. Epilogue: I remember this writing assignment from Sophie's beloved Mrs. Myers. Sophie arrived home on a warm Friday afternoon in September from Curtis Corner Jr.High. She settled down with her notebook or writing pad( I can't remember exactly what ) first in her big chair by the TV. Then, over the course of the weekend, she slowly moved to her bed, then to the kitchen table. Everyhere she went that weekend she was writing non stop. She barely came up for food. By Monday morning she slid into school with this story, complaining that her hand hurt from so much writing but pleased that she had ' got it out'. After I read it the first time I was amazed at how perceptively Sophie captured our experience. I have always felt with some guilt that I had selfishly opened a Pandora's Box during that 48 hours in which we made a mad dash 'home' to Czechoslovakia, a place that had teased my imagination since childhood. Patricia Hampl's Book, " A Romantic Education" is her autobiographical account of growing up as a second generation Czech in the midwest. Reading it always affirms my belief that many of us live the same psychic life. And even though those 48 hours Sophie, Sven, and I spent in Sobeslav were in somke ways sponatneously irresponsible I still want to go back. awwww sophie. cute and poignant. and sally, what an eloquent epilogue! both of you are beautiful writers. what happened to the epilogue that was posted here?